An ideal and easy to use component that helps to create a structured, industrial look to frameless glass partitions, G2G Black Banded Glazing Strip can create strong vertical and horizontal lines across glazing. Coupled with G2G Black dry joints – available in many profiles – this solution delivers a professional and yet bang on-trend style for interior designers and specifiers with projects in this field. The integral self-adhesive strip enables you to fix the banding in place with no further fixings or adhesive – installation is simple, mess-free and fast. Made of plastic, it is available in 1.5mm and 3mm thicknesses and can be used on any glass thickness. Reduce the risk of measurement errors by cutting to length with standard tools on site. This is a significant benefit that ensures less waste and greater productivity. Quickly apply this clever product to any door or wall partitions retrospectively, once they are installed. 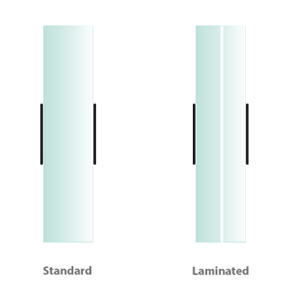 Most importantly, should you need to remove G2G Black Banded Strip from the glass, it will not leave a single mark, saving a further time-consuming headache. With such a comprehensive range of glass partitioning components and a proactive commitment to product development in this area, we’re proud to know that G2G is the preferred brand for many within the partitioning industry, and Reddiplex is a key supplier to involve in notable office interior projects. Reddiplex has been at the forefront of plastic and rubber extrusion since 1969, with extensive capability in complex custom extrusion projects. If you have any further questions about how we might be able to help you, please do get in touch with us.